Happy mid-winter celebration of your choice! Also, here’s a link to last year’s ‘Die Hard’ themed Christmas comic if you haven’t seen it! 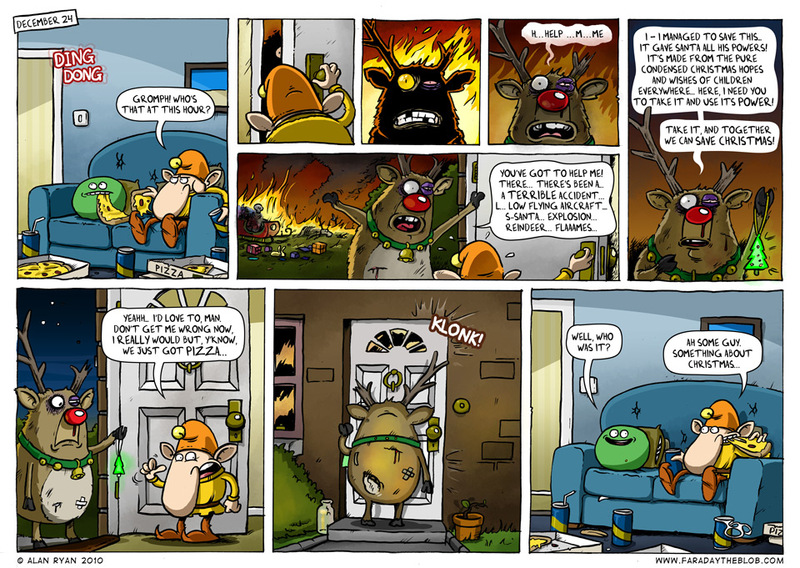 This entry was posted on Friday, December 24th, 2010 at 2:12 pm and is filed under Comics. You can follow any responses to this entry through the RSS 2.0 feed. You can skip to the end and leave a response. Pinging is currently not allowed. There’s always been something suspicious about that Rudolph anyway. Hope you and yours have a great yuletide season! Merry Christmas! Jynksie – He’s not that kind of elf! Jolly Xmas to you too man! Ah… I’d love to see Zizek analyze this. Amazing, amazing strip! Panels three and four are so great, I’m still laughing looking at them! One of the things I really love about Faraday is all the little details, you can just keep looking at the strips and always find something new. Things like the broken antler, it doesn’t leap out right away, but it’s really funny! K – Not too familiar with Zizek… Maybe you could perform a Zizekian analysis in his absence? Sandy – Thanks, as always I love the little extra details and visual gags in comics. Tony – Bah pizza, in this case! I think I’d treat ‘im the same way. When it comes to Christmas, I’m takin’ the day off. Great comic! I love the little details too – check out Santy’s flaming skull!! priceless. How out of shape is Rudolph? Hiller - 364 days of indolence will do that to a fella!